A Messy Church Holiday Club is held every Wednesday during school holidays from 10.30am to 12.30pm. An exciting event for children up to the age of 11 years, where they can safely enjoy games, crafts, singing, acting and of course have their healthy snacks. This is also a great place for mums to meet and socialise, and make new friends while their children learn through play and guided craft activities. Above all it’s an opportunity for everyone to enjoy themselves. All this for just £1.00 per child. During Holy Week a ‘Messy Church’ is held most days – please see ‘News’ page. An evening house group meets weekly in term time in St Asaph, with Bible study and discussion on the Christian response to the challenges that we all face. It is usually at 7.30pm and runs until 9pm. Speak to one of the churchwardens for details – more members always welcome. This is held in the church each Thursday at 11.00am. Everyone is very welcome to come along as we seek to discern God’s will. There is a parish Sunday lunch every month, held in The White House, Rhuallt, when we join forces with the cathedral congregation for a good meal, a chance to make new friends, and an opportunity to try to set the world to rights! There is a busy banner group, meeting every Monday 10.30am to 12.30pm, where banners for the church are designed and made. See church notice board/ pews sheets for details. No great sewing experience required, just enthusiasm, and on occasions much concentration may be needed as illustrated here ! These are a selection of the Banners that have been made and which hang in the church during the appropriate church season. But it’s work in progress, with many others planned. This is a flavour of the banners; see them all in the ‘Gallery’. A knitting group has just been established, which meets each Monday at the church from 10.30am to 12.30pm, where items are made and distributed to charitable organisations; presently items are being made for those living with dementia. It is not only a knitting group; it is a place where great natter abounds, a place for company, a place for tea and coffee. Just come along, it would be great to see you. A group meets every few months for an evening of churchyard maintenance, followed by refreshments. This is in addition to the regular grass cutting and tidying by members of the congregation. Details can be found on the church noticeboard and under special events. 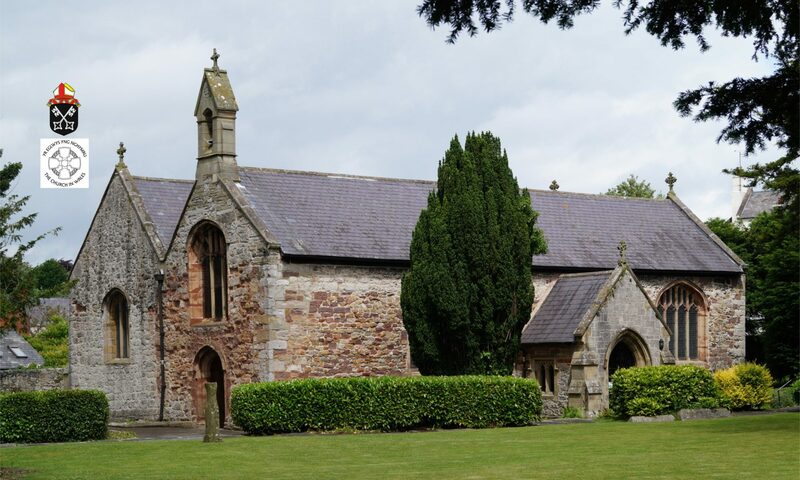 The old cemetery in St Asaph is the responsibility of the parish church. We keep Hebridean sheep there to keep the grass under control. We hold four work parties there each year on Saturday mornings – they are open to all, with a break for tea, cake and chatter. Dates are in the St Asaph City Times, in the special events and on the church noticeboard. Contact Duncan Cameron on 01745 583770 for details. Details of the burials in the old Mount Road Cemetery are held in a green folder in the church, and are also available online on the St Asaph City website. The two local primary schools are supported by regular visits of our clergy and lay members, when involvement with the church is encouraged. The pupils from Esgob Morgan Junior School and the VP Infants School attend the Cathedral each month and also come to the parish church for their end of each term service.